It works both ways – why change it? 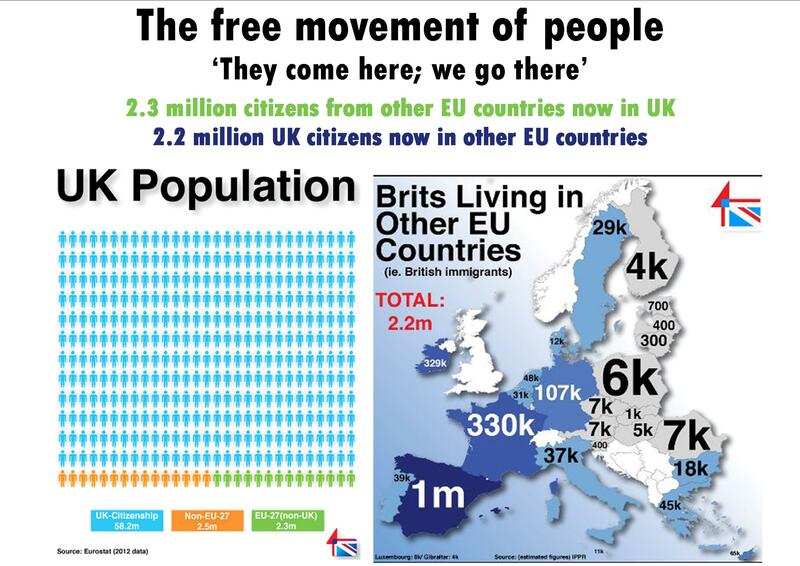 The free movement of people is a cornerstone principle of the European Union. Why change it? But that’s exactly what the British government has announced today that it wants to do. EU membership works both ways. Other EU citizens can come here; we can go there. Britain has benefited greatly from other EU citizens coming to Britain to fill jobs or to open or grow businesses here; just as the rest of Europe has benefited from our citizens travelling across Europe to work and to invest in businesses there. There are about the same number of Britons living in the rest of the EU as citizens from the rest of the EU living in Briton. 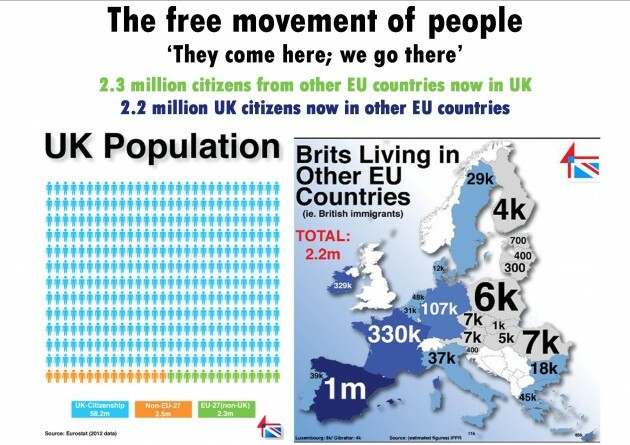 So if all those Britons came home, and all those EU citizens here went home, Britain’s population would be about the same as it is now. The evidence is that EU immigrants from Central Europe are around 60% less likely than British natives to receive state benefits, or tax credits, or to live in social housing. 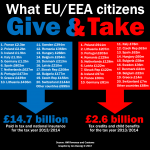 Furthermore, those EU immigrants pay almost 40% more in direct or indirect taxes than they receive in public goods and services. Almost 94 per cent of the working-age EU immigrant population are not claiming working-age benefits. They contributed about a third more in taxes than they received in benefits. According to research by University College London, immigrants to the UK from other parts of Europe in the last decade made a net fiscal contribution to the UK of about £22 billion. Most immigrants here from the rest of Europe are in gainful employment and make a substantial net contribution to our economy. This entry was posted in Current Affairs, Democracy & Citizenship, Economics & Trade, Global & International, Law & Justice, Politics & Public Policy, Society & Culture, The EU, Uncategorized and tagged EU, EU ROPE, European Union, expats, free movement, immigrants, immigration, Jon Danzig, migrants, UK Population. Bookmark the permalink. If you take into consideration the population differences between UK and continental EU, the non-significance of EU migration to UK stands even further out. 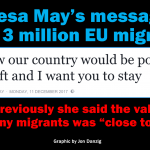 In the event that a referendum is set for the UK at some point – will it be inclusive of all those UK nationals who now reside/work/draw benifits and health care in other parts of the EU? One would hope that they shall not be excluded!! Phil Lucas – thanks for your contribution. British expats who have lived outside the country for more than fifteen years will not be entitled to vote in a referendum. The internet forums of British expats across Europe are expressing considerable upset about this. It also appears that EU citizens resident in the UK will also not be allowed to vote in a future referendum on the issue of Britain’s continued membership of the European Union. That sharply contrasts with the Scottish referendum, which will allow citizens from other EU countries resident there to vote on the question of Scotland’s independence. Really the EU is little more than a white supremicist organisation, a subsitsute white empire, why else would immigration from the rest of the world be precluded? Immigration Minister Mark Harper doesn’t understand his own Government’s policy. Ludicrously, he rebuked a pizza chain boss for not paying his staff enough. Eh? I thought that low wages were the second most important aim of our mass immigration policy (the other is to turn Britain into somewhere else and ‘rub the Right’s nose in diversity’[though of course he is somewhat wrong here, because as I have written above, diversity is limited to white diversity]). Why does he think the Minimum Wage has hardly risen in recent years? Why does he think that pay in so many occupations is now set so low that you can only survive on it if you live five to a room or roost in someone’s garden shed? While China is turning into a modern industrial nation, we are turning into a cheap labour state, and our grandchildren (who will work 18 hours a day in sweatshops) will all know enough Mandarin to beg for small change from Chinese tourists. How many of the Spain and France living Brits (almost 60% of the total) are retirees and how many actually working? I would be very interested to hear the answer to the previous question as well. The EU migration is often claimed to be a short- to medium-term fix to the problem of population ageing. However that would not be neccessarily true if the Britons abroad were there essentialy for work and not their retirement. Whomever attempts to answer the question, it would be very beneficial for me to know the source of the answer as well. I think that significant proportion of these emigrants would be enabled to leave to work abroad even without the policy of free movement and all that it entails. Correct me if I am wrong. Natalia, thank you for your contribution. You asked some questions. According to the British government’s latest statistics, there are an estimated 795,784 Britons living in Spain. According to IPPR, about 808,000 Britons live in Spain; 1,050,000 if you include Britons living there for part of the year. According to the British government, an estimated 400,000 Britons reside in France. According to IPPR, around 253,000 Britons live in France; 330,000 if you include Britons living there for part of the year. Migration Watch has yet different figures. They estimate that there are almost 370,000 British residents in Spain, of whom 62,000 are working. The remainder they estimate are economically inactive, of whom 73,000 are over 65. I think it’s possible that the Migration Watch figures are different to those of the UK government and IPPR, as many Britons apparently do not register as resident in Spain. According to government investigators, Spain is the number one country in the world for Britons committing benefit fraud. Many websites and media reports refer to a large number of British residing in Spain who are retired, with many of them making extensive use of the Spanish health service at great expense to the Spanish government. However, I have not yet been able to find the actual number of British pensioners living in Spain, but I am working on it. Regarding your question on whether people could still migrate to other EU countries if we abandoned the EU principle of ‘free movement’: yes I am sure it would still be possible, but it would not be so easy or uniform across so many European countries. In the past, immigrants needed visas and there was a lot of bureaucracy involved in moving to another country. 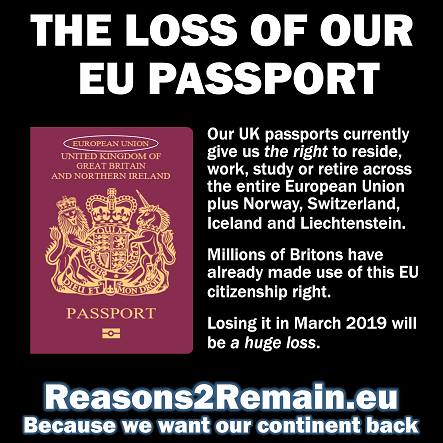 I, for one, don’t want to lose the right to live, work, study, retire or do business in any other EU country. It would be a backward step to abandon this principle; under EU rules British businesses can choose workers from across the EU, and British workers can choose to work or live in any other EU country. That presents a fantastic opportunity for us all.